Merritt Towers is a set of three high-rise condo towers that are each 8-stories tall. 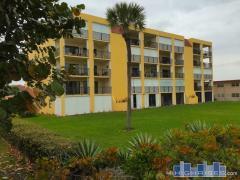 Merritt Towers Condos are right on the water in Merritt Island, FL. Community amenities include a fishing pier, tennis courts, a clubhouse, two pools, a spa, and sauna. Have any comments or questions about Merritt Towers? Ask your question and/or share your thoughts about this Building. Does anyone know if there is electricity and water at Merritt Towers?